Our Moon is the nearest celestial object to the Earth. It has always held an interest for Man since the beginning of recorded history. Its light shone down on the Earth, allowing safety at the night of illumination over the surrounding landscape. For the military, the opposite is true, as the appearance of the full moon may significantly affect their camouflage in operations or nighttime surveillance. In some instances, it allows the gathering of the farmer’s crops during the times of Full Moon, being the origin of the harvest moon. Daily the appearance changes from night to night. Sometimes we see the attractive thin crescent of the luna phase, while at other times perhaps during the thrid-quarter phase or during Full Moon, we see a brightly lit moon. Our Moon influences the flow and ebb of the ocean tides, to even control of the spawning of fish or corals in the seas. In some ways, it affects all creatures of the Earth. The Moon is about one-sixth the diameter of the Earth and some one eighty-first by mass. As the nearest neighbour to Earth, our moon is relatively a short stone’s throw away, whose distance averages about 384 373 kilometres. To imagine this distance, consider the family car travelling at the average speed of one hundred kilometres per hour. It would take 160 days or about 5¼ months to make the journey. This distance travelled is equal to about eight to ten years that the average car driver will spend behind the wheel! Ancient Greek mythologies saw the moon as Diana the Huntress, whose needed divine influence was importantly required for continued serene and peaceful order in the Heavens. Selene is from the Greek word for the Moon. Cynthia is also known as the moon goddess, whose Latin equivalent is Luna. Hence, in the western world selenography has become the study of all lunar features on the lunar terrain. Its Latin name also appears commonly is used in modern English as an adjective, so we still refer to, say, lunar eclipses or the lunar surface. Even the word lunatic applies to people who are presumably mentally disturbed, or more genenerally being moon struck, which is often conjectured to become worse around the time of the full moon. Our Moon is also nearly always associated as being female and feminine, and is usually directly related to subjects like childbirth and to the creation of new life. All human cultures have historically made the Moon to have similar strongly linked stories in the culture as everyday folklore. Today, some modern lore establish views towards romance. Many young men have actually tempted some young lass to a romantic dinner sitting under the pale moonlight. Why these links happen is probably more playing on the age-old effects of our moon influencing all humankind and the creatures of the Earth, but moreover, it is likely because of the continued belief of the beauty and mystery of this nearby world. Our Moon is the natural satellite of the Earth and orbits in an approximate period of 27 days 08 hours, or more exactly 27.321 66 days or 27d 07h 43m 11s, and is called the sidereal period. The Moon gives out no light of its own, but shines, as do all planetary bodies, by the reflected light from the Sun. All phases that we see on the Moon are produced by the differing angles regarding the positions of the Moon in its orbit around the Earth orbit relative to the Sun. (Figure 1) Times between consecutive alignment (Ie. New Moon to New Moon) is slightly longer in duration than the 27⅓ day period. This is primarily caused by the yearly motion of the Earth around the Sun and the extra time required to bring the Sun, Earth and Moon back into line. The whole period for consecutive phases is called the synodic period. For the Moon this is 29½ or more precisely 29.530 59 days or 29d 12h 44m, which is about 2⅙ days longer than the sidereal period. The true duration of the synodic period can vary by 0.512 days, as this also depends on the Earth-Sun distance, caused by the Earth’s own elliptical orbit. Between the phases of New Moon, First Quarter, Full Moon and Last Quarter the average period is 7¼ days. After the time of the New Moon, each successive night sees the lunar phase increase in size or waxes. After 14½ days Full Moon is reached, and then the phase cycle starts to decrease or wanes until the next New Moon. This entire period is called the lunation, and is based on the length of the synodic period. Lunations have been counted since the first one on 16th January 1923. Our Moon goes through its four main quarters every 29.531 days, whose complete cycle lasts one synodic month or lunation. It begins with the New Moon and ends with the next New Moon. As the Moon passes from New to Full it is waxing, and when passes from Full to New it is waning. Any waxing crescent phase is the period immediately after the New Moon and continues to First Quarter lasting roughly about seven days. The term waxing means that more of the lunar surface in time is becoming visible. A waxing gibbous Moon is the period after the First Quarter and leading up to Full Moon roughly fifteen days after New Moon. This is followed by the now waning gibbous Moon between Full Moon and Last Quarter, when the illuminated portion of the Moon is decreasing. Any waning crescent occurs between the Last Quarter phase onto the next New Moon. Here the half lunar disc over about the next few weeks, changes as a gradual decreasing sliver of light until it is no longer be seen after the 29th day of the lunar month. 1) The term waxing comes from an old English word meaning ‘growing’, while the word crescent originates from the Latin word for ‘increasing’. Originally both terms were used to describe the same phase. At one time it was common to use decrescent to describe the waning crescent, but this common usage has very much fallen out of favour. 2) The word gibbous means literally ‘hunch backed’ and often implies particular ugliness, yet this is way the Moon commonly looks for most of us when it appears in the sky. 3) Where seen as the crescent Moon is the shortest stage of the lunar phases, yet it is the most depicted in children’s drawings, in art and photography. As the phase changes, the time for moon rise and moon set increases on average by about forty-eight minutes each day, however, this value may vary considerably. This is due to the lunar motion increasing in both the north-south and east-west directions. Waxing crescents are will only be seen in the western sky after sunset, which at the earliest is always at least one day after New Moon. Alternatively, the waning Moon crescent Moon can only be seen in the eastern sky just before sunrise, about 6 to 7 days before any New Moon. A waxing gibbous Moon can be seen in the daylight sky as early as late-afternoon, and soon after the First Quarter remains in the sky until jusr after midnight. The waxing gibbous Moon can rise in the east as late as sunset just before Full Moon and remain in the sky through until dawn. A waning gibbous Moon occurs just after the Full Moon. It rises after sunset and remains in the sky most of the night and will set in the west after sunrise. The latest is the waning gibbous Moon will set is about midday and one day before Last Quarter. The draconic month is the period between one ascending node of the orbit to the next ascending node. 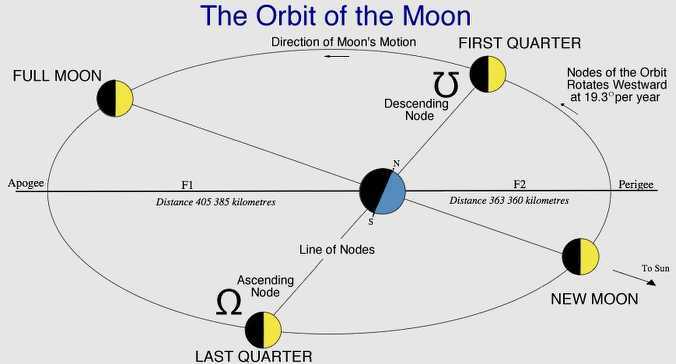 The ascending node is the intersection, from south to north, between the ecliptic and the Moon’s path, as normally it will lie either above and below the observed ecliptic. One draconic period is given as 27.21222 days, 0.10944 days shorter than the sidereal period. This value means that the orbit regresses by some 193 per year, or 16 times each draconic month. The realignment of these nodes takes about nine years to complete. (See Figure 2.) Combining the movement of the draconic month with the time the Sun crosses the same lunar node, is the basis for the calculation of eclipses with the Saros cycle. For these two to align it takes 6585.78 — just over nineteen years eleven (11) days. A repetition of solar eclipses within the Saros cycle can only occur when these two are again in alignment. For astronomers and astrophotographers, observing away from the city lights, the time of moon rise or set is critical. The Moon’s sheer brightness can cause the loss of all the fainter stars and other interesting celestial and deep-sky objects visible in telescopes. Most have to organise their scheduled observations well ahead to maximise their observing time. Normally during Full Moon few observations are undertaken, and to many astronomers our Moon is viewed as a total nuisance. Each time the moon rises and moon sets can often be found in the local newspaper or yearly ephemeris. The lunar face always roughly points in the same direction towards the Earth as the Moon has the same axial rotation as its period of 29½ days. It keeps this same face as it has been ‘locked-in’ the same direction by the strong tidal interactions between the Earth and the Moon. Other planetary moons are also known to show this effect, which astronomers call captured or synchronous rotation. Yet this is not strictly true because the observed lunar surface can show 59% of the surface observers on the Earth. 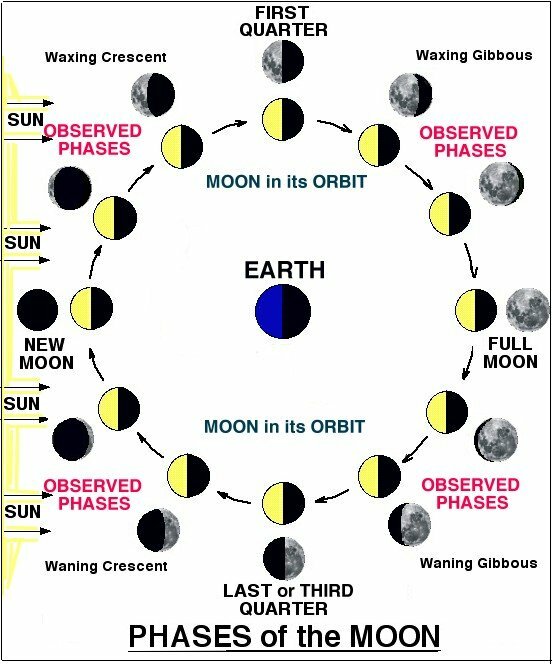 This is due to the fact that the lunar orbit is slightly elliptical in nature and also because it is tilted by 5.15° to the ecliptic. Earthbound observers sees the Moon appearing to ‘nod’ over the lunar month, these can be seen in perspective depending where the Moon lies in its orbit. The term used to describe this effect is called libration. It is the elliptical orbit of the Moon causes East-West Libration while the tilt of the ecliptic causes the North-South Libration. Also the true motion of the lunar orbit varies slightly through its orbit due to the fluctuations in the Earth’s gravitational field. Observations of stars that are sometimes obscured by the Moon, can accurately measure the exact lunar position. Such events are call lunar occultations. As stellar positions are known quite accurately then the position of the Moon can be determined accurately. All the variations that are seen are presently not fully understood through lack of long-term observation, but details about the Earth gravitational field continue to improvement eclipse predictions of both Sun and the Moon. Much of this knowledge has been achieved from observing many lunar occultations of the years.